Every summer since 1946, scientists and students with the Juneau Icefield Research Program (JIRP) have lived on and studied the Juneau Icefield in southeast Alaska. One of the main projects conducted by the program is measuring and monitoring glacier velocities and surface elevation changes using high-precision GPS. The purpose of this site is to present the data and results of these GPS surveys. Why the name Crevasse Zone? Simple. Crevasses are the number one hazard encountered by those of us who live and work on glaciers. All our survey work is done with GPS, often in total whiteout or limited visibility conditions. And since crevasses and the danger they present are constantly on our minds when we're on the Icefield, and because I needed a catchy name for this web site, I couldn't think of a more appropriate name than The Crevasse Zone. I'm Scott McGee and I live in Anchorage, Alaska. By profession I'm a GIS Specialist and Cartographer for the U.S. Fish & Wildlife Service, specializing in the application of GIS to land management issues within the National Wildlife Refuges of Alaska. For the last 25 years I have been a surveyor and faculty/staff member with the Juneau Icefield Research Program. 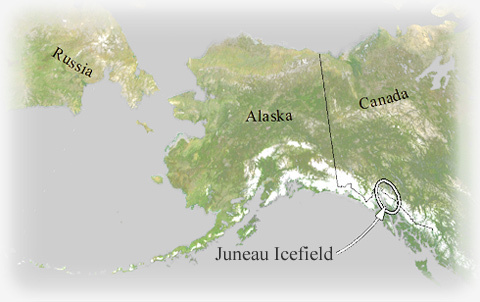 The Juneau Icefield is located between the towns of Juneau and Skagway in Alaska and the town of Atlin in British Columbia. It covers an area of about 1,700 square miles (4,400 square kilometers) and spans the international boundary between the U.S. and Canada. It is one of many icefields and glaciated areas stretching from southern British Columbia to the Alaska Peninsula (see map below).